Check out all videos on a specific topic. Language is messy, and the fact that there is more to talk about with third declension i-stems is evidence of that fact. What if I told you that there were words that *looked* like i-stems, but only had half the forms? Or that (again) *looked* like i-stems, but were actually not i-stems at all? 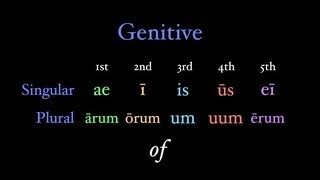 This video covers the rest of what we need to worry about with this interesting part of the third declension. The third declension is a little bit more varied than many choose to admit. 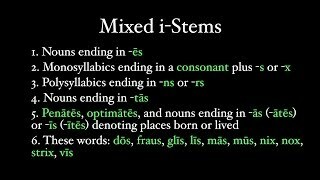 Along with the standard endings (which belong to the consonantal stems of the third declension) are those that are used with third declension words ending in an -i in their stem. 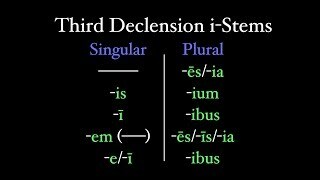 These are the third declension i-stems, and they aren't *that* different from the third declension consonantal stems. 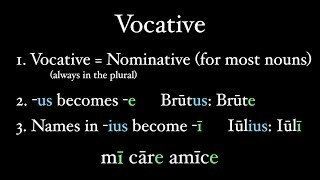 With most words, Latin shows location by using the preposition in plus the ablative case. 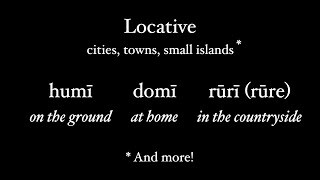 But this isn't the case for cities, towns, and small islands (and a few other words), which have kept a very old case - the locative. The third declension has nouns of all genders, including the neuter. Unlike the regular masculine/feminine declension, neuter nouns must follow our rules of neuter, which makes their declension slightly different. This video also covers how neuter i-stems are formed. Hey you, learn this case. It's pretty easy, given that for most nouns it's the same as the nominative. 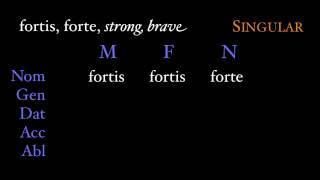 The only differences come with words that end in -us, like Brutus, dominus, filius, Sempronius, and meus. The genitive case is the "of" case in Latin, and its most common use is to show possession, often a noun possessing another noun (statua Claudiae, Claudia's statue), but also an author of a work (carmen Vergilii, the poem of Vergil), or even someone who has a certain quality (virtus Bruti, the virtue of Brutus). Much like their first and second declension counterparts, third declension endings modify nouns, with which they agree in three ways: case, number, and gender. It's just that these adjectives have third declension endings, and that there are three different types of these adjectives. The third declension has many of the most interesting Latin words. 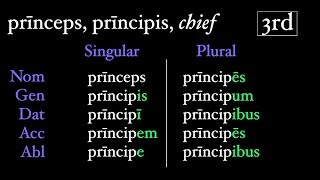 This video covers the declension of third declension nouns in the masculine and feminine genders, how they are translated, and other peculiar features of this fascinating grammatical group. 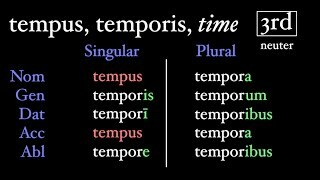 Latin doesn't have to be hard, and with the help of online descriptions of complicated grammatical topics, I hope it isn't. If you're a teacher, feel free to use these videos in your class, either to flip the learning, or for review. If you're a student, learn as much as you can. Check out the about page for more information.